Ash & Rowan leaves (& trees) are really different to look at - which sounds stupid as Rowan is Mountain Ash I think. Neither has had leaves up here for well over a month. Rowan has very distinctive orange berries that turn red (they are still hanging on to branches for dear life) . 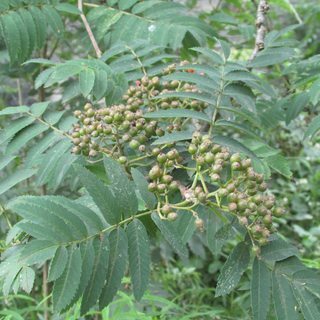 Right - the tree I saw a few days ago had berries, but it's the only rowan/ash tree I have ever seen with berries. [IMG] [/IMG] Study leaf shape - its quite distinctive. Thank you, that's really kind of you. The tree overlooking my garden is not that, even though I'd been reassured it was Rowan. It must be Ash as I haven't seen any leaves like those before. 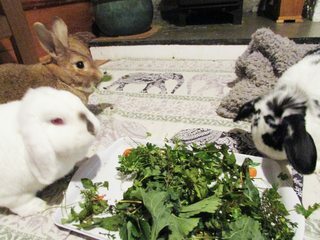 My rabbits have had a very large bundle of leaves (no twigs) over the past few days for their breakfast. These have always been Apple, Pear, Ash, Alder and Hazel. Every day they have eaten them, based on the following preferences, Alder first, then Ash, Apple, Pear and Hazel. Indeed the Pear and Hazel get left until they can be sure that nothing more tasty to them is going to be delivered. It's not the result I would have predicted. Anyone foraging for Christmas decorations etc? Which of these are growing wild? The Herb Robert is particularly impressive at this time of the year Haven't seen any here for a while. From what I can see in the garden we've still got Red Deadnettle and Cow Parsley. Could probably find some Dandelions. There are also still a few Alder leaves dropping. This sounds really "rural villagey" How does it work? Does everyone do a bit of the planting and tending? How large an area is it?